Yesterday, Contrast "finally" released Launch Center Pro for iPad which brings Automation and easy execution for often used tasks to your iPad, or like Contrast puts it: "It’s like speed dial for everyday tasks". If you're already familiar with Launch Center Pro for iPhone (which is sold separately and currently on sale), you can get right into it. The two versions aren't that different and offer similar interactions with other apps and services. The biggest difference: It's now on the iPad, and who hasn't been waiting for that? As previously mentioned, Launch Center Pro for iPad is basically a bigger version of Launch Center Pro, and that's the same for the design. It's the same familiar look with the same tapping for actions and swiping for groups feature. The app supports both portrait and landscape orientation, but due to its grid the tiles stay where they usually are, which may seem a little strange at first, but you'll get used to the way it behaves. First thing to do is go trough the Settings. Besides changing the theme to what style you prefer, I think it's important to "Sign In" to your Dropbox to enable Dropbox Actions and Backups. And here's the second important step, enabling "Automatic Back Up". This way, if you happen to delete a workflow, your work isn't lost. The moment you tap on the pencil again (where you create your actions), a backup will be created. This also allows you to import your Backup from the iPhone version. And finally, if you're using TextExpander, update the TextExpander Snippets so they can work with Launch Center Pro. If you're not that familiar with Launch Center Pro and what it does, there's a "Help" section in Settings where you can read a lot about basic usage, but also find documentations for "Power Usage". And if you really want to dig into Launch Center Pro and its really powerful features, you can follow this link which will direct you to a search for "Launch Center Pro" on MacStories. Once you'll get into it, you won't be able to stop that easily. The (visual) difference between an action (= a task or workflow that executes something the moment you lift your finger) and a group (= can be seen as a folder for actions), is that actions have rounder square icons, and groups have circle icons. As previously mentioned, an actions gets executed the moment you lift your finger, when tapping on a group, swipe to the action you want to use execute and lift your finger. To start with some basic things, you can go through the examples and edit them the way you like, or create new actions and groups. To edit something or create something new, tap the pencil icon in the upper right corner. For example when editing, select the "Search" group and tap on Google. Launch Center Pro uses Safari to launch a Google search with a basic URL and adds a prompt to enter "Search Terms" in Launch Center Pro, which will then open in Safari. To create a new action, tap on an empty tile which has a big "+" sign in "edit mode" and select Action. Tap on "Action Composer", select "System Actions", "In-App Messaging", and "Message Photo". Name the Action "Daily Selfie" and as a recipient ("To"), you either select a friend, your mother (from the Contact icon above the keyboard), or leave this area blank to choose when sending. You can even schedule this action to every day in the morning, so you'll get a notification about this important task. 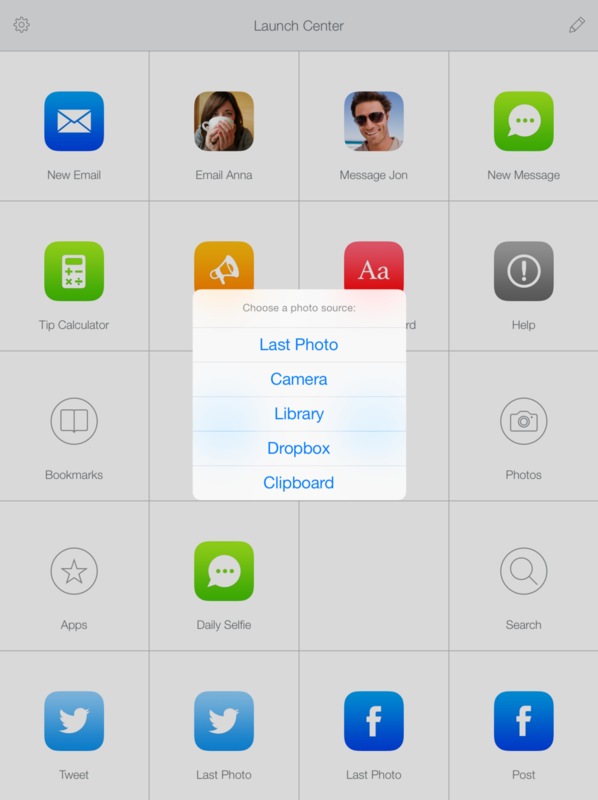 After having created this action, tap on it and you get to choose the photo source which can be your last taken photo, the camera, your Library, and you can even search your Dropbox or add a photo from your Clipboard. Add some text or let your picture do the talking and hit send. And there you go. The first action has been created to make a daily task simpler. As this "version" of Launch Center Pro is also an update for the iPhone counterpart there are some nice updates since version 2.1 of which I talked here. A big improvement for "Power Users" may be the possibility to move actions (which can be found in edit mode in the action/group itself), and there is now also a way to interact with text files in your Dropbox. For more information about creating new text files, appending and prepending text, you can find a documentation on "Dropbox Actions" on Contrast's Help page. Two really nice new features are the "speak action" which lets you enter or copy any text (or you could create an action that inserts your clipboard) to have it read out loud to you, and the "define action" which - well - defines your text. Another little improvement is that you can now use two fingers to launch group actions. It seems like a no brainer for the iPad version, but wasn't available for the iPhone until now. To make your workflow even faster, it's really nice to have this new feature now as well. Launch Center Pro (for iPad) is in my opinion an app that lets you do so many things, where the possibilities are only limited by your imagination (and the device of course), but you know where I'm going. If there's an itch you want to scratch, Launch Center Pro for iPad may be able to help you with it. Once you get started trying out some workflows, you'll find yourself wanting more. I suggest you put it on your home screen, if not in your dock, and start with simple tasks. You'll thank me later. Launch Center Pro for iPad is available on the App Store for $4.99 (launch price), and to celebrate this release, the iPhone version is also available for only $2.99 right now.